Usually in moist places: meadows, marshy ground, along streams, thickets and swamps (coniferous and deciduous); deciduous, mixed, and coniferous forests, especially along trails and in clearings; ditches and roadsides. 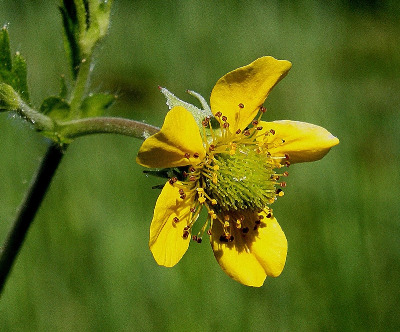 Quite variable in leaf shape and other characters, but recognized by the achene beak sparsely hairy at the very base (otherwise smooth), densely short-pilose receptacle, and yellow petals. There is often a short thick stalk (up to 4 mm long) in the fruiting head, not so pronounced as in G. rivale and G. vernum. This is our only species in which the pedicels may be almost as densely long-hairy as in G. laciniatum, which differs in having white petals shorter than the sepals, essentially glabrous receptacle, and achenes with glabrous beak (and sometimes also body, though this is usually pilose at the summit). MICHIGAN FLORA ONLINE. A. A. Reznicek, E. G. Voss, & B. S. Walters. February 2011. University of Michigan. Web. 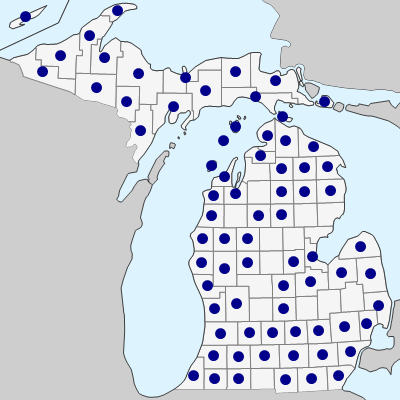 April 24, 2019. https://michiganflora.net/species.aspx?id=2484.